Put all of your problems away into their own individual compartments. Pull one problem out at a time when you’re ready to deal with it. It makes things more manageable when you’re not looking at all of your problems all at once. But many people don’t know what to do once they pull the problem out. It’s a timeless process, but we’ve put our own spin on it to make it easier to remember. State exactly what the problem is. Until you’ve defined your problem clearly, you can’t solve it! Isolate the root cause of the problem. A lot of times, we stop at the symptoms of the problem. You have to find its point of origin or you won’t solve it! Brainstorm for possible solutions. BRAINSTORM, don’t analyze. Get all of your ideas on paper so you can solve it! Determine the pros and cons of each solution. You won’t know what’s best until you analyze it. Then you can solve it! Get rid of all but the single best solution. You’ve done the research. Now go with what you believe is the best option so you can solve it! Work your solution to make your solution work. You have to take action to solve it! You’ve established benchmarks so you know whether or not your solution is working. Check periodically against these benchmarks. Keep an eye on the problem to make sure that you solve it! So the next time you have a problem – SOLVE IT! Isn’t that simple? If you found this helpful, pass it on to your friends so they can SOLVE IT, too! And that sustained thinking is most productive when you use an organized process. That’s how you can take any problem and SOLVE IT! Next time, we’ll look at the fear that often holds people back from their dreams. Until then, here’s to your bigg success! 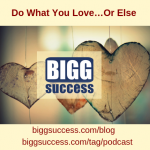 https://biggsuccess.com/wp-content/uploads/2015/07/BIGG-Success-Nurturing-Your-Inner-Entreprener.jpg 0 0 George Krueger & Mary-Lynn Foster https://biggsuccess.com/wp-content/uploads/2015/07/BIGG-Success-Nurturing-Your-Inner-Entreprener.jpg George Krueger & Mary-Lynn Foster2008-03-04 00:13:282015-06-14 16:14:50Have A Problem? SOLVE IT! This is great!! I’ve printed your blog today and posted it on my cubicle wall. I tend to be the problem solver at work. Glad you have found our post today to be useful. Maybe you can point out the new “post” on your cubicle to your problem reporting co-workers, so they can find solutions without your assistance! We wish you bigg success, Jasmine! This is so helpful. So many of us get overwhelmed at times, it’s hard to keep things in perspective. Awesome! Glad you found and will continue to find this useful Ramya! An easy to remember 7 step process to problem solving….